Announced early 2012, the OM-D E-M5 was one of the most warmly received models of the year. As with any new camera, the initial interest was centered on the promising specification. Not only did this model herald a new 16-Mpix MOS sensor complete with a unique 5-axis stabilized platform (and up to 5 stops compensation for camera shake), but the retro looking E-M5 was aimed squarely at enthusiasts. Even without the optionally available grip, it offered continuous shooting at up 9fps, and up to 4.2fps with the stabilizer active and it was the first from the firm to adopt a built-in (1.4M dot) EVF and feature a weatherproofed magnesium alloy shell. To top it all, the firm claimed the contrast detection AF function of OM-D E-M5 was one of the fastest available, even when compared against typically much swifter phase-detection equipped DSLRs. With camera in the hands of reviewers and users alike, the camera also proved to be immensely popular for its quality of output, eventually cementing the $999, body only OM-D E-M5 as one of the best selling cameras of the year. Several months later and just ahead of Photokina 2012, rival maker and partner to the Micro Four Thirds alliance, Panasonic announced its new flagship model, the GH-3. As with the E-M5, this new $1,299 model was aimed at enthusiasts and while it adopted a weather sealed alloy body and MOS sensor with a similar pixel count (16-Mpix), it had several promising features over the E-M5. First, as the successor to the GH2, this new model offered extensive video capabilities, including a raft of formats and codecs, frame rates (from 60 to 24 fps) and bit rates (up to 72Mpbs). The GH3 also featured a 1.74M dot EVF, uncompressed HDMI output and headphone monitoring, making it a serious rival to full frame models such as the Nikon D800 and Canon EOS 5D Mk III. As a stills camera, the GH-3 was one of the first to add built-in WiFi to link to smartphones and tablets, as well as in-camera HDR, multi-exposure modes and continuous shooting at up a very respectable 6fps. Externally, the Olympus OM-D E-M5 and the rival Panasonic Lumix DMC-GH3 couldn’t look any different though they do share a number of similarities in their core specification, including sensor, EVF and articulated rear display panel. Although the video capabilities are quite impressive, the OM-D is principally designed as a stills camera, whereas you could say the reverse is true of the GH3. This likely accounts for the stronger AA filter and the slightly lower DxOMark lens scores when compared with the E-M5. Both makers have however adopted dissimilar and conflicting stabilization systems, making cross-system lens choices more tricky. Somewhat ironically, the E-M5’s integral 5-axis stabilized sensor system is generally considered to be superior, especially for handheld video, to the in-lens based optical image stabilization technology currently favored by Panasonic (not to mention, Nikon, Canon et al). The preference isn’t based solely on results between the two, but also on the fact the Olympus system is more flexible, allowing the, not in-considerable, benefit of image stabilization with any lens fitted regardless of its focal length, type or construction (or use of such a lens with the required adaptor). That said, with the announcement of the new Lumix DMC-GX7, complete with in-body image stabilization, there’s a strong indication Panasonic may follow Olympus with all their future models. Apart from that, and image quality, one other significant concern for potential purchasers must be autofocus. Both cameras adopt contrast detection AF, which is relatively fast and efficient in both models but it is also somewhat dependent on the focus motor and mechanism adopted by each lens. Fortunately, both Olympus and Panasonic have gone to considerable lengths to make the AF drive system suitable for both movie capture and stills. In the past, providing the lens focused accurately and quickly that was really all that mattered for stills, and little or no additional consideration was given to how smooth or quiet the system was in the process. Although ultrasonic type AF systems are for the most part quiet, they were not originally designed or intended for video, therefore, Panasonic, Olympus and Sigma (and others) are adopting linear driven AF systems on their latest models that allow for these small, rapid, continuous and smooth adjustments. Look out specifically for the MSC designation for Olympus lenses. As a relatively new and evolving system, the lens range isn’t as extensive as the 35mm based offering for DSLR cameras, such as Canon or Nikon, obviously, but when combined together the Olympus and Panasonic lenses outnumber those of rival mirrorless systems. Third party lens makers Tokina, Tamron, Schneider Kreuznach, Voigtlander, Samyang and Sigma have since joined the MFT lens alliance, but, of those, only the latter three have introduced a small number of models with a suitable mount. We’ve analyzed 27 lens models in total, mostly from Panasonic and Olympus. As one of the most expensive models available for MFT cameras, the $899 Olympus M.ZUIKO DIGITAL ED 75mm f/1.8 is the best performing lens of the range that we’ve had in our labs. As the equivalent to a 150mm (in 35mm format) it’s a rather specialized model, where the longer focal length and fast aperture are ideal for indoor sports or even outdoor portraiture. Not to be outdone by the Tatsuno-based maker, Panasonic’s Leica branded Summilux DG 25mm f/1.4 is the next best in terms of optical quality and is a more conventional and versatile 50mm equivalent. At $579, it’s another high-end model, but it’s an excellent performer nonetheless. If a moderate telephoto is required and the 75mm is a bit steep, then $389 45mm f/1.8 can be easily recommended. It shares the same ranking as the 25mm Leica Summilux model for IQ, focuses to just 50cm and is both light in weight and compact. Wide-angle primes are still a bit thin on the ground but as the equivalent to a 24mm, the compact metal-bodied 12mm f/2.0 is ranked fifth in our database and performs very well. 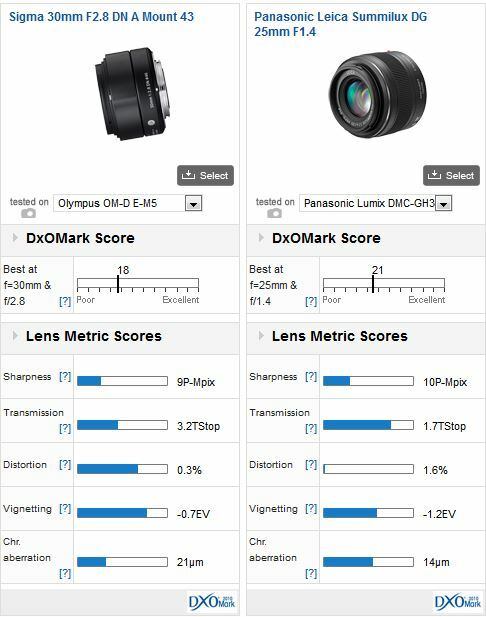 With similar sensors, the ranking of the lenses remains unchanged between the Panasonic flagship GH3 and the OM-D E-M5. 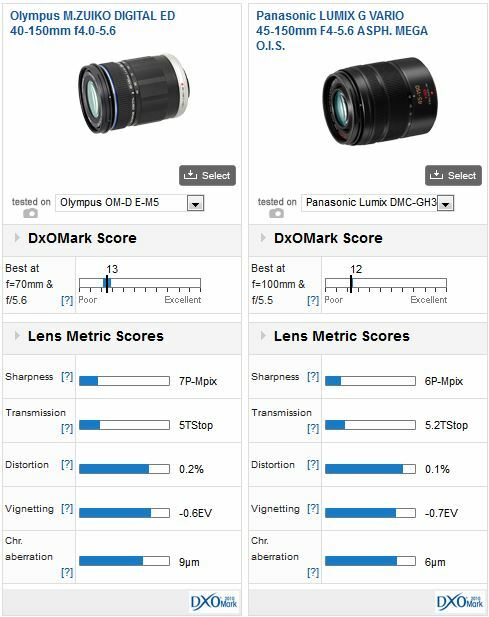 There is a difference in DxOMark score, however, with the OM-D E-M5 delivering slightly better results, in some case by as much as three points for the best performing lens gradually falling toward equal scores for the lower-end optics. Differences in the choice of anti-aliasing filter between the two manufacturers are the most likely reason for the disparity between the two cameras. 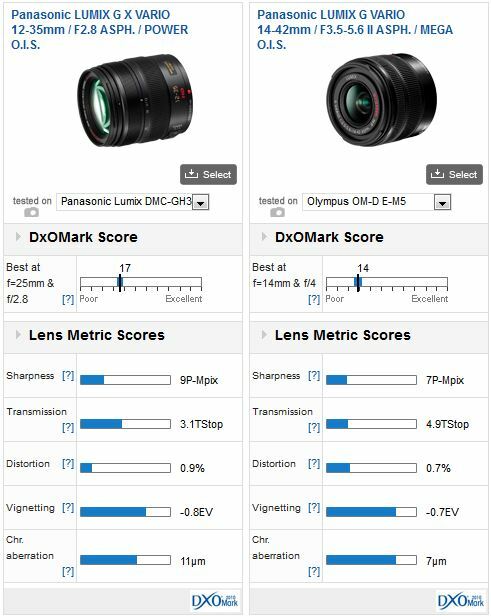 With a DxOMark lens score of 23 on the OM-D E-M5, and 21 on the GH3, the best performing standard lens in our database is the Panasonic made Leica-branded Summilux DG 25mm f1.4. Not only is a good performer optically, it’s a well specified lens suitable for both stills and video capture as it features fast and smooth focusing with a linear type AF motor. Compared with the sensitively priced ($199) Sigma 30mm f/2.8, which is our budget choice, the Leica is the better of the two optically. 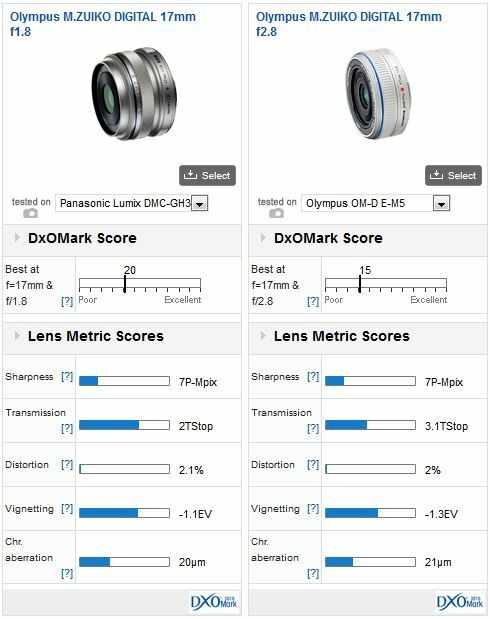 While the overall DxOMark score of 18 points for the Sigma looks close to the 21 points of the Leica (above), the Sigma’s performance is enhanced in this comparison by the slight differences in the sensor of OM-D E-M5; mounted on the GH3 the score is a little lower (at 16 points). Mounted on either the E-M5 or the GH3, whichever way you look at it the Leica is the better performer. It has higher levels of sharpness and lower chromatic aberration (though still not particularly great), while the Sigma has better control of vignetting and distortion. It’s worth remembering though that as with some rival camera systems, the Panasonic cameras rely on in-camera correction of distortion, vignetting and chromatic aberration, not only during live view and playback but also in the resultant JPEG images and Raw files (with suitable raw conversion software). Olympus cameras do the same, except they don’t correct lateral chromatic aberration, so many of these aberrations are unlikely to be really noticeable by users. Of the wide-angle primes analysed (and we’ve yet to test the Panasonic 20mm f1.7 and 14mm f2.5), the best performing of those in the database is the new $500 Olympus 17mm (35mm equivalent) f1.8 with a DxOMark lens score of 22 points. The firm’s high-speed 24mm equivalent narrowly misses the top slot at 21 Points. With respectable IQ and seriously small dimensions, the 17mm f/2.8 is the value proposition at $300, though bear in mind it’s an early model and the AF system is somewhat noisy and not particularly suited to video. For all round flexibility nothing quite beats a zoom lens. It’s here that you’ll find a wide range models from both camera makers. Of those the best performing model we’ve analyzed is the Panasonic Lumix G X Vario 12-35mm f2.8 ASPH Power OIS, a weatherproof, image stabilized model and the equivalent to a 24-70mm. In fact, of the top three zoom lenses, not one is made by Olympus, which is perhaps at odds with their reputation as one of the leading lens makers in Japan (but may just reflect that they’ve yet to offer models at this level, and at this price). In second and third place, then, is the similarly specified, weatherproof and stabilised 35-100mm (70-200mm). At $1,300 it’s not for everybody but it’s flexibility and fast maximum aperture is promising. At the other end of the focal range is the highly regarded 7-14mm (14-28mm equivalent), another compact model with an attractive capability and very good image quality. If budget is a concern, the Olympus 9-18mm f4-5.6 may be an option. As the equivalent to an 18-36mm it’s not as extreme as the 7-14mm and at $700, it’s still a sizeable sum, however, the model is small and light in weight and is decent performer optically. Value options include the starter 14-42mm lenses, all are reasonably priced and, ultimately, very good performers, even if they’re less glamorous than their pricier counterparts. 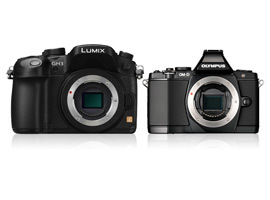 With its similar sensor, the GH3 replicates the rankings seen with the OM-D E-M5. It’s worth keeping in mind though that while the models share the same mount some of the Lumix lenses adopt built-in image stabilisation, whereas this feature is not present on the Olympus models, relying instead on the stabilised sensor platform of the Olympus cameras. Standard zooms are justly popular and MFT camera owners can benefit from quite an extensive range of models from starter type lenses costing from $245. In fact the Panasonic Lumix G Vario 14-42mm f/3.5-5.6 II ASPH Mega OIS is well made and has respectable image quality. However, it will come as no surprise to learn that the best-performing zoom in MFT format currently is the maker’s $1129 Lumix G X Vario 12-35mm f2.8 ASPH Power OIS model. Although quite a big stabilised lens, it complements the larger body of the GH3 and has good, consistent image quality throughout the zoom range. Peak performance is achieved at 25mm at f/4. Anyone looking for the utmost in portability should consider Panasonic’s ‘pancake’ zoom, the Lumix G X Vario PZ 14-42mm f/3.5-5.6 II ASPH Mega OIS. Although video-oriented with a power-zoom feature and a manual focus lever, it weighs just 95g and measures just under 27mm when stored. At $399, it’s ranked third in our standard zoom category. The telephoto zoom with the best image quality is currently the Panasonic Lumix G X Vario 35-100mm (70-200mm equivalent) f2.8. This high-grade constant aperture zoom is the natural complement to the firm’s 12-35mm f2.8 and shares a number of similar features including ED glass, weatherproofing and optical image stabilisation. At $1,300 it is, however, the most expensive lens in the Micro Four Thirds line up. At just $236, the best value telephoto zoom in the range has to be the Olympus M.Zuiko Digital ED 40-150mm f4.0-5.6 with a DxOMark Lens Score of 13 points and 7P-Mpix Sharpness score. If brand loyalty is important, the rival offering from Panasonic, the $300 Lumix G Vario 45-150mm f4-5.6 ASPH Mega OIS performs similarly, yet has slightly more consistent performance (albeit with slightly lower levels of sharpness), lower CA and boasts stabilisation. If you have an Olympus OM-D E-M5 or a Panasonic Lumix DMC-GH3 and a favorite lens, we would very much like to hear from you. Please leave a comment below, stating what lens it is and why you like it.